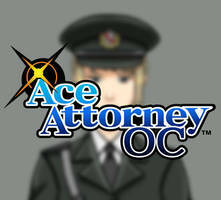 I made a character sheet for the OC that I designed for the Ace Attorney OC contest on court-records. Some artistic choices I made (artist's statement? 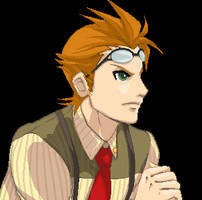 ): I wanted to make his design a bit less crazy compared to the typical Ace Attorney characters as the game that I'm basing this on (so Dai Gyakuten Saiban) is a bit more dimmed down in terms of the character designs; I was researching the cast from the game and they looked like they could be real (realistic hair and eye colours) with a few exceptions (so Iris Watson, for instance). However, something I noticed throughout the Ace Attorney characters was that almost every character had elaborate and not plain designs. And I noticed this especially in DGS like with Sherlock or Iris. I decided to add lots of accessories/gadgets relating to my character to create the steampunk look as well as embodying Victorian London (a time of great innovation) and the game, Dai Gyakuten Saiban. The background is from the magazine scans of the character profiles from DGS. Good lucj in the contest he looks really cool! Good luck to you too! Your character looks so cool......EVERYBODY can relate to the weeb. The weebiness is NEEDED. 100 Points giveaway!! (CLOSED) WINNERCongrats!! the winner is :iconIllyDragonfly: !! wooh! I need to thank you guys for all of the support and i truly love helping others, especially since the core fiasco. I try to do a monthly giveaway and here is another for my lovely supporters, watchers and all the artists of DA! Have fun!! and good luck! » First come, first serve! » If paying with PayPal, send to zwu25@hotmail.com (as gift). » You may reserve spots. » No refunds after I've completed your commission. ✖ I do not draw furries/animals. ✖ I do not draw mecha. ✖ I do not draw people with lack of hair. ✖ I do not draw anything explicit/hateful/racist/sexist/pornographic. ♥WARNING: Some of the previews may be very old, the art below may not be the same, please go to the actual gallery to for more accurate previews.